Preppers are generally knowledgeable. We take the time to learn about risks, continuously educate ourselves, and acquire a wide range of skills. When we share this knowledge, it can come off with a ‘know-it-all’ type of tone, which can make the listener tune out or dismiss what you are trying to tell them. This can be frustrating to everyone involved. The knowledge sharer thinks the listener simply does not want to learn, and the listener believes the knowledge sharer is a cynical jerk. Simply put: presentation can be just as important as content. Cynical types typically don’t care if they are perceived as cynical. Many preppers that fall into this category prefer to be the ‘lone wolf’ prepper. They avoid groups, or only accept a group if they are offered a position of power. “My way or the highway” tends to be the mantra, which is perfectly fine if they always know what they are doing. The danger occurs when they don’t. Cynical preppers assume the worst in others. They are preparing because somebody is inevitably going to screw something up and cause SHTF. There is little sympathy for those unprepared or uninformed of SHTF risks. These assumptions can protect a cynical prepper in an emergency, since it would be very difficult to betray someone that doesn’t trust many to begin with. One of the most important ideas for a happy prepper is the idea of community. Prepping groups are the culmination of this: a group of like-minded individuals with strengths that cancel out each other’s weaknesses. In order for a group to work, there has to be trust. For a happy prepper, that is where cynicism stops and the potential for cooperation and collaboration are realized. But why are they happy? Happy people make better group members. You could argue that they enjoy groups because they are happy, or that they are happy because they are in a group. Either way, pleasant people are more pleasant to be around– even if you are preparing for SHTF. Whereas cynics tend to point out defects and deficiencies, happy people build others up and point out opportunities. There is a misconception that ‘happy preppers’ would have their head in the clouds dreaming of dandelion utopias. That may be true for a few, but the majority simply use a positive tone and avoid tearing others down. 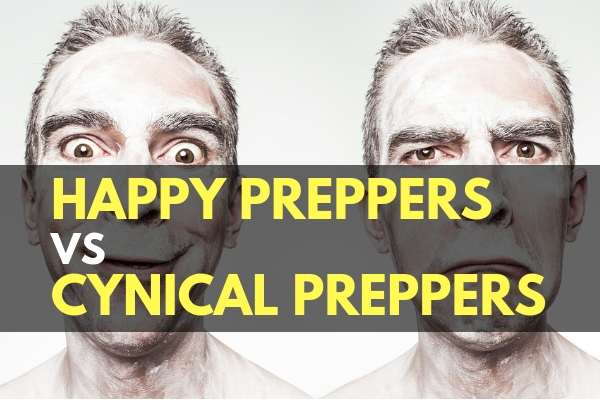 Happy refers to tone and presentation, rather than the end scenario- which all preppers know are not typically ‘happy’ situations. So which is it? 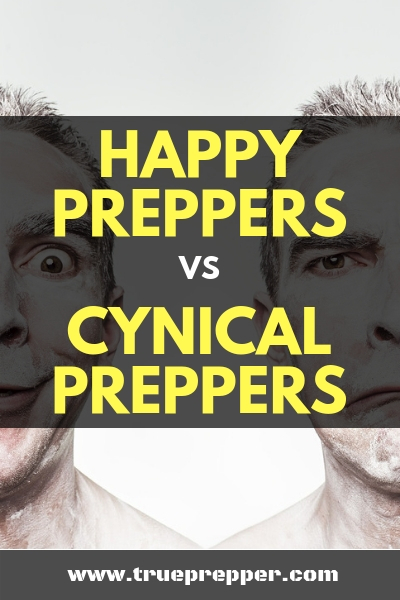 Are you a cynical prepper or a happy prepper? Well, now I challenge you to throw away that label. As I mentioned in the beginning, there are strengths and weaknesses to both types. Labels are meant for the grocery store and prepping is much more deep and nuanced than a simple label could describe. Aspire to take the strength from both the happy preppers and cynical preppers to shore up your own weaknesses. To recap, the main strengths of a happy prepper are their sense of community and their way to effectively and pleasantly communicate. The main strengths of a cynical prepper are the way they question the status quo and find answers to tough problems. Having the perfect blend of these is impossible. Yet, it is something worth striving for. Question intentions without offending others. Become knowledgeable, but not a ‘know-it-all’. Find a group, learn new skills, and volunteer in your community. If you are never asking questions or exploring the ‘what-ifs’, perhaps you need to be a little more cynical. If prepping feels like lonely drudgery, or if you find yourself abrasive in groups, maybe you should try to be a little more happy. Find the middle ground and thrive. Keep exploring, stay prepared, and be safe. cynical prepper here” if you don’t know them, haven’t worked with them or spent time with them, then DONT TRUST THEM”!!! Old saying, “A cynic is merely an optimist with more experience”! An optimist sees light at the end of the tunnel, the cynic is the one at the end of it with the torch! First an observation: There are undoubtedly a lot of solo or “lone wolf” preppers but in any real SHTF scenario the is no such thing as a solo survivor. Then a comment: If you are NOT one of those ‘happy preppers’ who have their head in the clouds dreaming of dandelion utopias I want you to think seriously about your favorite TEOTWAWKI scenario, then think six months to a year into that future. What do you see? If you see yourself, or your family, or your prepper group, living a reasonably stable and acceptable existence, I have a surprise for you: YOU ARE one of those happy preppers with your head in the clouds dreaming of a dandelion utopia! Consider this – humans are social animals. A new social structure WILL arise even in the midst of chaos. It’s nice to believe in some sort of Utopian social structure with everyone working together to help everyone survive together. FORGET IT! In every social structure, someone WILL take charge. Consider what it will take to ‘take charge’ of that mob of cynical preppers eking out a hand to mouth existence in the aftermath of your favorite scenario, then realize that someone IS going to take charge, and that someone will assemble followers supporting them. Think about what kind of society that will be. At this point, if you aren’t cynical yet, congratulations, you might be a candidate for that “someone” position, because that “someone” is not going to be one of the crusty old cynics, and it isn’t going to be a real ‘happy prepper’ but it will be a cynic who is successful at pretending to be a happy prepper so he can sell his followers on a plan to create that Dandelion Utopia which they are going to start building just as soon as they finish organizing society.